First published in 1998, this edited volume reflected on the role of universities and aimed to improve the preparation of social welfare professionals by the University of Warsaw for employment in the new market-oriented society that was being created in Poland after the end of ‘real socialism’ in 1989. Many of its articles were previously published in Polish and were published, revised and updated, in English for the first time in this collection. The contributors discuss two key issues. First, should universities worry about the employment of their graduates and the skills that are needed by the wider economy and society or just focus on transmitting advanced learning? Second, they considered the modernisation of the welfare state. The Polish experience, and the Western partners’ reaction to it, has proved an excellent case study for these issues. Part 1. Social Policy and Social Change. 1. From Socialist to Liberal Utopia: Changes in Poland’s Social Policy since 1989. Józefina Hrynkiewicz. 2. Politics and Social Policy in the New Poland. Fred Powell. 3. Current Trends in Family Policy: European Union Countries and Poland. Marek Rymsza. 4. Family Policy and Family Life in Poland. Anna Kwak. 5. Social Policy and the Family in the United Kingdom. Gillian Pascall. 6. Changes in Prison Policy as a Part of Political and Economic Transformation in Poland. Andrzej Mościskier. 7. Recent Trends in English Penal Policy. Paul Roberts. Part 2. Social Policy and Economic Change. 8. Higher Education and the Labour Market in Britain. Daniel Lawrence. 9. Trends of the 1990s in Swedish Welfare Policy – Implications for Social Work Education. Lennart Nygren. 10. The Prevention and Relief of Unemployment in Britain. Paul Ransome. 11. Changes in the Polish Labour Market During the Period of Transformation. Ewa Giermanowska and Józefina Hrynkiewicz. Part 3. 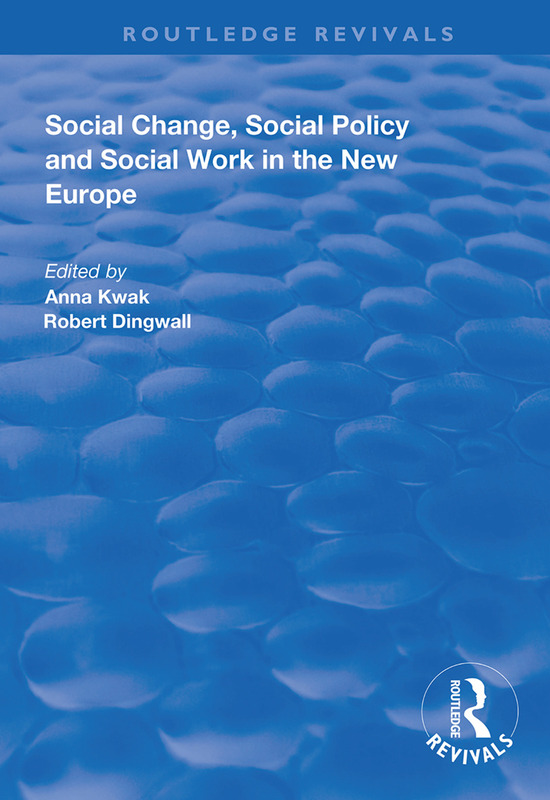 Social Work in the New Europe. 12. The Irish Model of Social Work. Fionnuala Lordan and Izabela Rybka. 13. The Development of Social Work in Britain 1869-1996. Mark Lymbery. 14. The History of Social Work in Sweden. Staffan Öberg. 15. Social Work Education in Britain. Mark Lymbery. 16. Delivering Social Work Education in Partnership in Britain. Tina Eadie. 17. The Development of Social Welfare in Poland. Izabela Rybka.